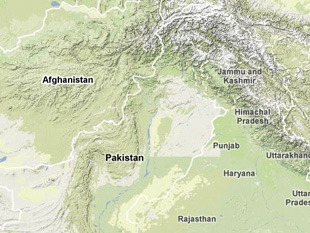 In the mid-1970s Pakistan embarked upon the uranium enrichment route to acquire a nuclear weapons capability. Pakistan conducted nuclear tests in May 1998, shortly after India's nuclear tests, declaring itself a nuclear weapon state. Pakistan currently possesses a growing nuclear arsenal, and remains outside both the Treaty on the Non-Proliferation of Nuclear Weapons (NPT) and the Comprehensive Nuclear Test Ban Treaty (CTBT). Hans M. Kristensen and Robert S. Norris, "Pakistan's Nuclear Forces, 2011," Bulletin of the Atomic Scientists, 67(4), 2011. SIPRI Yearbook 2015 (Stockholm: Stockholm International Peace Research Institute, 2015). "Global Fissile Material Report 2015," International Panel on Fissile Materials, December 2015, www.fissilematerials.org. Mark Hibbs, "Pakistan Developed More Powerful Centrifuges," Nuclear Fuel, 29 January 2007, p. 1, pp. 15-16; Jeffrey Lewis, "P3 and P4 Centrifuge Data," Arms Control Wonk, 15 February 2007, http://armscontrolwonk.com; David Albright and Serena Kelleher-Vergantini, "Pakistan’s Fourth Reactor at Khushab Now Appears Operational," Institute for Science and International Security, 6 January 2015, http://isis-online.org. "History of PAEC," Pakistan Atomic Energy Commission, 13 December 2011, www.paec.gov.pk/paec-hist.htm. Feroz Hassan Khan, Eating Grass: The Making of the Pakistani Bomb (Stanford, CA: Stanford University Press, 2012). George Perkovich, "Could Anything Be Done to Stop Them? Lessons from Pakistan's Proliferating Past," in Pakistan's Nuclear Future: Worries Beyond War, Henry D. Sokolski, ed., (Carlisle, PA: Strategic Studies Institute, 2008). Nuclear Black Markets: Pakistan, A.Q. Khan and the Rise of Proliferation Networks, (International Institute for Strategic Studies: London, 2007). Feroz Hassan Khan, Eating Grass: The Making of the Pakistani Bomb (Stanford, CA: Stanford University Press, 2012), p. 100. Bruno Tertrais, "Not a 'Wal-Mart', but an 'Imports-Exports Enterprise': Understanding the Nature of the A.Q. Khan Network," Strategic Insights, Vol. VI, Issue 5, August 2007. "Interview with Abdul Qadeer Khan," The News (Islamabad), 30 May 1998, http://nuclearweaponarchive.org. T.V. Paul, "Chinese-Pakistani Nuclear/Missile Ties and the Balance of Power," The Nonproliferation Review, Summer 2003. Nuclear Black Markets: Pakistan, A.Q. Khan and the Rise of Proliferation Networks, (London: International Institute for Strategic Studies, 2007). Bruno Tertrais, "Kahn's Nuclear Exports: Was There a State Strategy?" in Pakistan's Nuclear Future: Worries Beyond War, Henry D. Sokolski, ed., (Carlisle, PA: Strategic Studies Institute, 2008). Rai Muhammad Saleh Azam, "When Mountains Move – The Story of Chagai," The Nation, www.defencejournal.com. "Text of Prime Minister Muhammad Nawaz Sharif Statement at a Press Conference on Pakistan Nuclear Tests," Islamabad, 26 May 1998, http://nuclearweaponarchive.org. Scott D. Sagan, "The Evolution of Pakistani and Indian Nuclear Doctrine," in Inside Nuclear South Asia, Scott D. Sagan, ed., (Stanford: Stanford University Press, 2009), pp. 219-220. Tamara Patton, "Combining Satellite Imagery and 3D Drawing Tools for Nonproliferation Analysis: A Case Study of Pakistan's Khushab Plutonium Production Reactors," Science & Global Security, 20:2-3, p. 137. David Albright and Robert Avagyan, "Construction Progressing Rapidly on the Fourth Heavy Water Reactor at the Khushab Nuclear Site," Institute for Science and International Security, 21 May 2012, http://isis-online.org; David Albright and Serena Kelleher-Vergantini, "Pakistan's Fourth Reactor at Khushab Now Appears Operational," Institute for Science and International Security, 16 January 2015, http://isis-online.org. This estimate will vary depending on operating time of each reactor. Tamara Patton, "Combining Satellite Imagery and 3D Drawing Tools for Nonproliferation Analysis: A Case Study of Pakistan's Khushab Plutonium Production Reactors," Science & Global Security, 20:2-3, p. 137. David Albright and Paul Brannan, "Pakistan Expanding Plutonium Separation Facility Near Rawalpindi," Institute for Science and International Security, 19 May 2009, www.isis-online.org; David Albright and Robert Avagyan, "Construction Progressing Rapidly on the Fourth Heavy Water Reactor at the Khushab Nuclear Site," Institute for Science and International Security, 21 May 2012, http://isis-online.org. Peter R. Lavoy, "Islamabad's Nuclear Posture: Its Premises and Implementation," in Pakistan's Nuclear Future: Worries Beyond War, Henry D. Sokolski, ed., (Carlisle, PA: Strategic Studies Institute, 2008). Feroz Hassan Khan, Eating Grass: The Making of the Pakistani Bomb (Stanford, CA: Stanford University Press, 2012), pp. 351-352. Vipin Narang, "Posturing for Peace?" International Security, Vol. 34, No. 3, Winter 2009/10. Mohammad Ilyas Khan, “Why Pakistan Is Opening Up Over Its Nuclear Program,” BBC, 21 October 2015, www.bbc.com. Feroz Hassan Khan, Eating Grass: The Making of the Pakistani Bomb (Stanford, CA: Stanford University Press, 2012), p. 386. "Pakistan Warns against India Nuclear Support," Dawn, 25 January 2011, www.dawn.com; Narayan Lakshman, "Top U.S. Official Says Pakistan Holding up FMCT Negotiations," The Hindu, 1 February 2011; Brian Rose, "Bleak Outlook for 2011 Conference on Disarmament," USIP Peace Brief 78, 28 January 2011, www.usip.org. "Pakistan Blocks Agenda at UN Disarmament Conference," The Daily Times, 20 January 2010, www.dawn.com; "Pakistan Rejects Atom Bomb Material Cut-Off Talks, Cites Danger From India," Reuters, 25 January 2010, www.reuters.com. "Pakistan Ready to Phase Out Nukes If India Does So," The Daily Times, 24 May 2009, www.dailytimes.com.pk; and National Command Authority Press Release No. PR166/2011-ISPR, Inter Services Public Relations, 14 July 2011, www.ispr.gov.pk. "Country Perspectives on the Challenges to Nuclear Disarmament," International Panel on Fissile Materials, 2010, www.fissilematerials.org. "Pakistan Rules Out Test Ban Treaty Endorsement," Global Security Newswire, 19 June 2009, www.globalsecuritynewswire.org; "No Proposal to Sign Nuclear Ban Treaty," Global Security Newswire, 1 January 2010, www.globalsecuritynewswire.org. "Pakistan Joins Initiative to Combat Nuclear Terrorism, Establishes Strategic Export Control Division," International Export Control Observer, June/July 2007, p. 3, www.nonproliferation.org. IAEA, "Communication of 17 October 2011 from the Permanent Mission of Pakistan to the Agency concerning the Export Control Policies of the Government of Pakistan and a Statutory Regulatory Order," INFCIRC/832, 30 November 2011, www.iaea.org. U.S. Department of Homeland Security, "Radiation Detection Testing Underway at Two Foreign Sea Ports," Press Release, 11 April 2007, www.dhs.gov. Abdul Hameed Bakier, "Jihadis Discuss Plans to Seize Pakistan's Nuclear Arsenal," Terrorism Monitor, 26 May 2009, Vol. VII, Issue 14, pp. 4-5, www.jamestown.org; "Al-Qaeda Commander Threatens U.S.," AlJazeera.Net, 2 June 2009, http://english.aljazeera.net. Declan Walsh, "Militants Attack Pakistani Air Force Base," The New York Times, 16 August 2012, www.nytimes.com. Shaiq Hussain, "Militants Storm Pakistan Air Base; 10 Killed," The Washington Post, 15 August 2012, www.washingtonpost.com. Simon Tisdall, "Pakistan Nuclear Projects Raise U.S. Fears," The Guardian, 3 May 2009, www.guardian.co.uk. "Pakistan Nuclear Staff Go Missing," BBC News, 12 February 2008, http://news.bbc.co.uk; "Pakistan 'Nuclear Kidnap' Foiled," BBC News, 15 January 2007, http://news.bbc.co.uk. Michelle Marchesano, "Meeting the Nuclear Security Challenge in Pakistan," Partnership for Global Security, Conference Report, April 2008, www.partnershipforglobalsecurity.org. Paul K. Kerr and Mary Beth Nikitin, "Pakistan's Nuclear Weapons: Proliferation and Security Issues," Congressional Research Service Report RL 34248, 30 November 2011, www.fas.org. "NA Passes National Command Authority Bill 2009," The Daily Times, 29 January 2010, www.dailytimes.com. Peter R. Lavoy, "Islamabad's Nuclear Posture: Its Premises and Implementation," in Pakistan's Nuclear Future: Worries Beyond War, Henry D. Sokolski, ed., (Carlisle, PA: Strategic Studies Institute, 2008); Khalid Banuri and Adil Sultan, "Managing and Securing the Bomb," The Daily Times, 30 May 2008, www.dailytimes.com.pk. Peter Wonacott, "Inside Pakistan's Drive to Guard Its A-Bombs," The Wall Street Journal, 29 November 2007, http://online.wsj.com. Mark Thompson, "Does Pakistan's Taliban Surge Raise a Nuclear Threat," Time, 24 April 2009. Sharad Joshi and Togzhan Kassenova, "Pakistan and Cooperative Threat Reduction," Nuclear Threat Initiative, Issue Brief, 4 August 2008, www.nti.org. Farhan Bokhari and James Lamont, "Obama Says Pakistan Nukes in Safe Hands," The Financial Times, 29 April 2009, www.ft.com. “Pakistan-PM Remarks at First Plenary Session on Mar 24, 2014,” Nuclear Security Summit 2014, 24 March 2014, www.nss2014.com. “Pakistan Deposits Instrument of Ratification of Amendment to Convention on Physical Protection of Nuclear Material in Vienna,” Ministry of Foreign Affairs – Government of Pakistan, 24 March 2016, www.mofa.gov.pk. Baqir Sajjad Syed, "Expectations for civilian nuclear deal dampened by US," Dawn, 9 April 2010, www.dawn.com. "UN Endorses India-US Nuclear Pact," The Australian, 4 August 2008, www.theaustralian.news.com.au. "Pakistan Seeks Equal Access to Civil Nuclear Technology," Dawn, 12 April 2010, www.dawn.com; Louis Charbonneau, "Pakistan Offers Global Nuclear Fuel Services Again," Reuters, 13 April 2010, www.reuters.com. “Pakistan-PM Remarks at First Plenary Session on 24 March 2014,” Nuclear Security Summit 2014, 24 March 2014, www.nss2014.com. "Nuclear Power in Pakistan," World Nuclear Association, updated August 2011, www.world-nuclear.org. Mark Hibbs, "Pakistan Deal Signals China's Growing Nuclear Assertiveness," Nuclear Energy Brief, 27 April 2010, Carnegie Endowment for International Peace, www.carnegieendowment.org. David Albright and Serena Kelleher-Vergantini, "Pakistan’s Fourth Reactor at Khushab Now Appears Operational," Institute for Science and International Security, 16 January 2015, http://isis-online.org; Global Fissile Material Report 2014, International Panel on Fissile Materials, http://fissilematerials.org.